Downstairs in the metals studio of the Honolulu Museum of Art School, Kaori Vaughn sports long black hair, a striped shirt and a heavy duty tan apron. 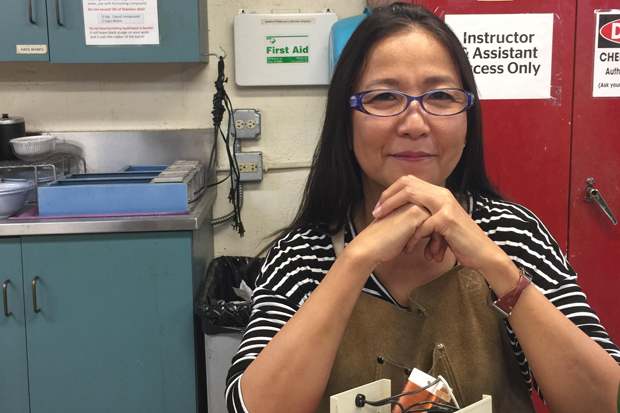 It’s fair to say that the apron is somewhat a staple of her look—Vaughn is the metals studio manager and an admired teaching artist for jewelry making classes, after all. Teaching in the metals studio is actually something that Vaughn never thought she’d end up doing. In her past life, Vaughn worked as a television producer in Japan until she moved to Hawai’i and became a new media art student, then a metals lab assistant and finally, a teaching assistant at Kapi’olani Community College. Then Cynthia Wiig, a former metals lab instructor at the Art School, took Vaughn under he wing as her own teaching assistant. Since then, Vaughn has never looked back. Some of the pieces made by Vaughn’s students. Vaughn now teaches various classes in the metal studio; this summer, those classes are Intro to Jewelry Making, Advanced Jewelry Making, and Intermediate Metal Fabrication. We sat down with Vaughn to learn more about her experience teaching the Art School. Why do you like teaching at the Art School’s metal studio? I loved just using my hands, that’s why I started. I’m kind of a crafty person. As soon as I started I loved it. But before I started to teach, it was different. After I started teaching, I really wanted to help students and work with them. It’s an experience. If I do something by myself, it’s only my experience, but because I have a lot of students, their experience will be my experience. That’s something I love. What are some of your favorite memories with your students? A lot of the students from the beginning don’t have any idea of what they want to make and they start to use their hands and by the end of the semester, they always have something they can wear. After week two or three, they usually make something and if they show me or they send it to me in a picture, at that time, I feel really great. They give it to their family and take a picture and they send it to me. 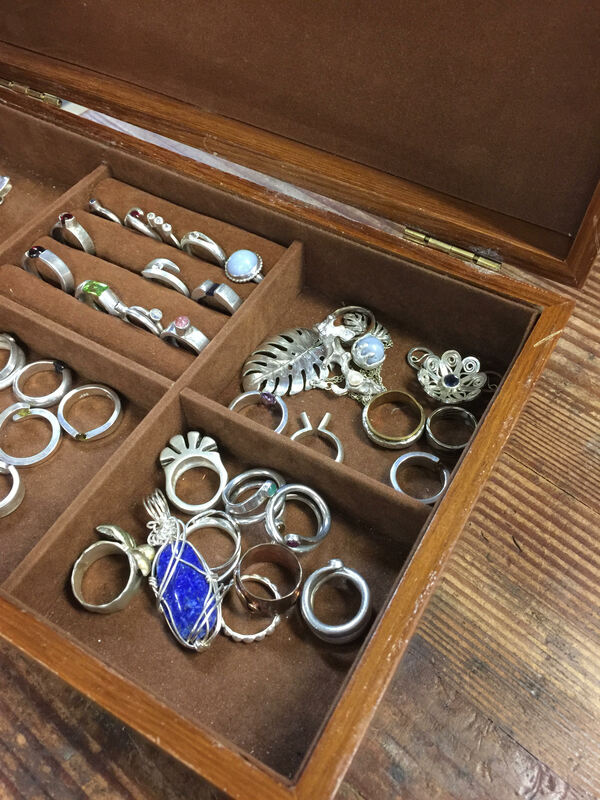 What’s your favorite part about working with metals and making jewelry? Students bring some picture or whatever that they want to make and we figure it out with them, like how to make it—and we usually make it! It’s really nice to have some idea of what they want to make. I don’t like copies so my students have to change something…[but when we] figure it out together, that’s really nice. Whatever they want to make, I want to help. Brian Marshall. He is an American sculptor and is not famous yet—I guess—but I love his robots. He uses recycled materials and creates cute robots. They make me smile. I love anything that makes people happy! Summer 2018 registration for the Art School is currently open.